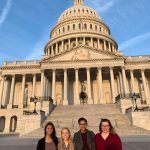 The Schubert Center enables experiential learning for undergraduates through externships with community organizations and institutions, policy-oriented trips to Washington, D.C., and opportunities for attendance at national conferences. Made possible by support from the Mann Endowment Fund, the following opportunities help students gain a personalized view of the ways in which research and policy can converge to impact the lives of children and families. 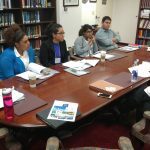 Mann Child Policy Externships give students the opportunity to work directly with professionals who design and implement policies that impact the lives of children and families. 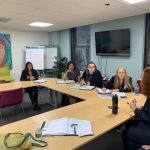 With supervision from the Schubert Center, students are placed with local policy organizations working in areas of child health, education, law, juvenile justice, mental health, and child welfare. The Mann Child Policy Externship is now also available as an undergraduate capstone experience in anthropology, childhood studies, and psychology. Follow the links below for more information and application instructions. 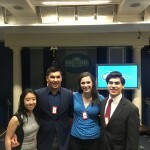 Check out the “Spotlight on our Students” publications with examples of past externships and senior capstone projects. Experiential Learning in Child Policy (CHST 302) is a course offered annually through the Childhood Studies program. 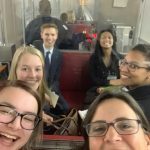 The course gives students an in-depth understanding of state and federal legislation impacting children, youth, and families, and includes an experiential learning component in which students visit Washington, D.C. to meet with policymakers and see the legislative process in action. Learn more about the 2019 Child Policy trip to D.C. Attendance at national conferences exposes students to the most current research in the field and provides valuable professional experience. With support from the Mann Endowment Fund, students enrolled in courses in the Childhood Studies program have had the opportunity to attend conferences of the Society for Research in Child Development and the Society for Research on Adolescence.